Chilean President Michelle Bachelet has announced emergency measures to deal with the destruction caused by Saturday's massive earthquake. The 8.8 magnitude quake - one of the most powerful recorded - devastated central parts of the country, killing more than 700 people. Troops are being deployed to help with rescue efforts and prevent looting. A curfew is in force in some areas. Basic supplies are to be distributed as rescuers reach worst-hit areas. There's almost no doubt that the death toll will rise over the next few days. There are still whole areas of the south of Chile which haven't really been fully explored, and nobody has a clear idea of how bad the damage is there, and how many people have died. I get the sense that the government is totally overwhelmed at the moment by the magnitude of this quake. In Concepcion, the city closest to the epicentre, there were ugly scenes, with scores of people breaking into supermarkets and just taking anything they could get their hands on. It's been more than 48 hours since the quake, and people are getting desperate - in many areas they still don't have water, they still don't have food, and they still don't have electricity. "We face a catastrophe of such unthinkable magnitude that it will require a giant effort," Ms Bachelet told reporters on Sunday in the capital, Santiago. The curfew, which began at 2100 local time (2400 GMT), applies in the region of Maule - where more than 541 are confirmed dead - and in Concepcion, Chile's second city. Both areas are being placed under special rules to speed up the delivery of aid. The army has been sent to support police to prevent unrest in Concepcion, south of Santiago. The mayor has said food is running out and the situation in the city is getting out of control. 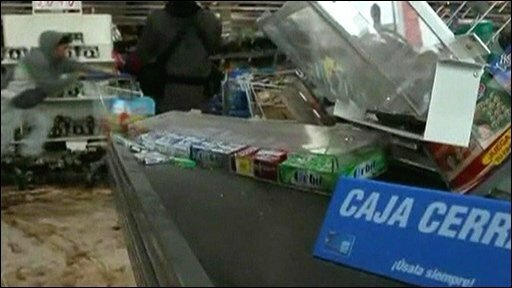 Supermarkets and chemists have been looted and thousands of people remain homeless. Meanwhile, the Pacific Tsunami Warning Center has lifted its Pacific-wide alert, after fears of high waves failed to materialise in many countries. But Chile itself saw waves inundate coastal towns. Defence Minister Francisco Vidal said the country's navy had made a mistake by not immediately issuing a tsunami warning after the earthquake, a move that could have helped coastal residents flee to higher ground sooner. He added that an alarm sounded by port captains had saved hundreds if not thousands of lives. Meanwhile rescue teams are still trying to reach dozens of people believed to be trapped in a collapsed block of flats in Concepcion. Many Chileans are spending a second night outdoors, afraid to stay in damaged homes. Reports say 350 bodies were found in the devastated fishing village of Constitucion - which was hit by both the quake and the tsunami it set off. In the port of Talcahuano more than 20 boats were swept ashore and dumped in the streets by the waves. Officials say public transport services are slowly returning to normal. One metro line in Santiago is operating. Roads are passable, although with diversions. The airport in Santiago has reopened. It had been closed because of damage to the terminal and control tower. The epicentre of the quake was 115km (70 miles) north-east of Concepcion and 325km south-west of Santiago. About 1.5 million homes have been damaged. Most of the collapsed buildings were of older design - including many historic structures. About 90% of the historic centre of the town of Curico was destroyed. Many roads and bridges across the affected area were damaged or destroyed. One US risk assessor, Eqecat, put the cost of the damage at between $15bn and $30bn (£9.8bn-£19.6bn) or 10-20% of gross domestic product. Responsibility for reconstruction will soon pass to President-elect Sebastian Pinera, who takes office in two weeks. "It's going to be a very big task and we're going to need resources," he said. Chile did not initially request foreign assistance, but Ms Bachelet later said some offers of aid would be accepted. She said Chile needed field hospitals, temporary bridges, water purification plants, damage assessment experts and rescuers to relieve those already working to find survivors.